Star 1. Point me to a decent article about SpaceX. There are many about SLS which won't fly till 2021. SpaceX is flying and destroying the competition with reusable boosters that the establishment said wouldn't work. Just for that there should be much interest in this magazine. Is it hard to find SpaceX information on the interwebs? You realize that the subject of spaceflight includes a lot more than just one company launching rockets, right? As Shakespeare said: Expand thy horizons, dude. Blackstar you shouldn't be so condescending. Of course I get my news from all sorts of places. But the point of my original comment was that I no longer buy this magazine as it seems to ignore SpaceX. If all you want is SpaceX, then all you need is Elon's Twitter feed. But there's more going on in space than SpaceX. Blackstar you are simply not understanding my point. I want a balanced view of everything spaceflight related. 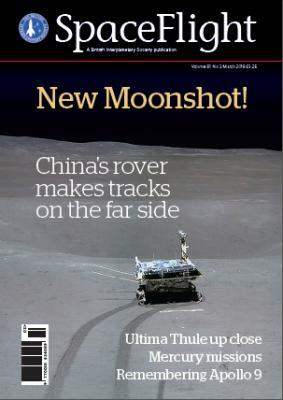 Spaceflight magazine simply does not provide that, as I have explained. And we have explained to you it does. You’re the one with the narrow take on the space industry not the magazine. Space historian Gerard van de Haar FBIS has researched the plethora of European payloads carried to the International Space Station by SpaceX Dragon capsules. He describes the wide range of scientific and technical experiments supporting a wide range of research initiatives. Former scientist and spacecraft engineer Dr Bob Parkinson MBE, FBIS takes us back to the origins of the International Space Station and explains his own role in helping to bring about a British contribution – only to see it migrate to an unmanned environmental monitoring platform. On the 100th anniversary of the company’s birth, Philip Corneille traces the international story behind a range of Rolex watches used by astronauts and cosmonauts in training and in space, plus one that made it to the Moon. Ken MacTaggart FBIS tracks down the company building the first domestic UK satellite launcher in 50 years and explains how it can revolutionise low-cost services for small satellites, as well as igniting a resurgence in rocket development. of another Kuiper Belt object – the mysteriously shaped Ultima Thule. From the US, Dwayne A. 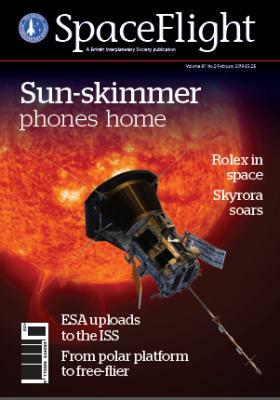 Day reveals the persistent attempts of planetary scientists to attract more attention to the exploration of the planet Mercury – an endeavour in which they haven't always succeeded! of the most complex and demanding operations so far in the race to the Moon. Writer and award-winning space historian Francis French describes what it was like to find an unpublished memoir from an astronaut on NASA’s first crewed Apollo flight and how it came to be turned into a book.